Nobody likes an untidy desk at work and even if you’re one of those who works in an organised mess. You still know how to find things when you need them quickly. The same goes for your computer files. There is nothing worse than having applications and programs all over the place, as it can make it difficult to locate them in a hurry. 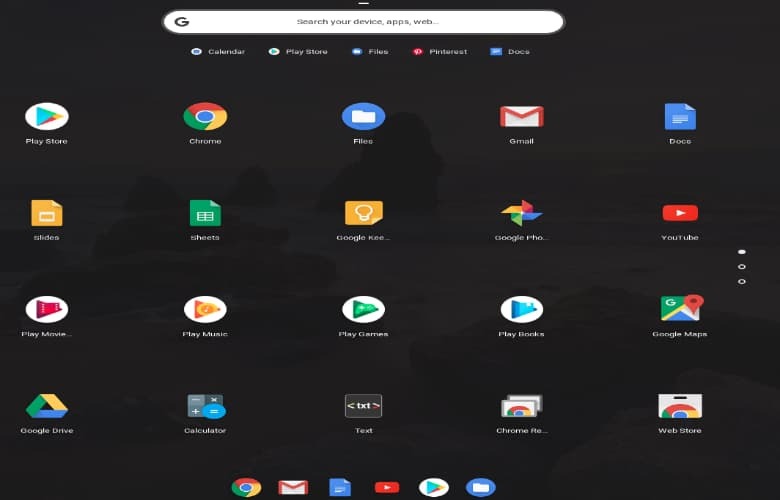 Like any computer, this can also be the same as the Chromebook if you do not tidy up your Apps. The longer you leave it the worse it will get. Most of us detest cleaning and it’s very similar in nature, but once you’ve tidied up you feel a whole lot better. 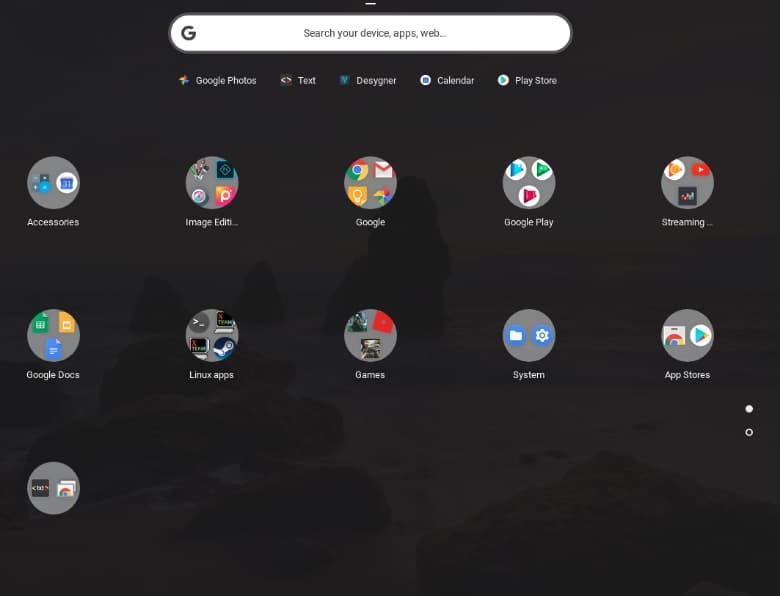 Luckily, you can easily tidy up your Apps on the Chromebook, so let’s have a look at how you can do this. The Chromebook comes with a few apps as standard. Most of these are Google Apps such as ‘Play Books’, ‘Play Games’ and so on. When you install a lot of Apps they are then displayed over several screens. The maximum Apps per page is twenty, so if you’ve got a lot of Apps installed they can take up a few pages. The problem is things can start to get a bit messy if you start to install a lot of Apps. This is even more so now you can install Android Apps on your Chromebook. Now I don’t know about you but I like to have some kind of order when using a computer. It’s far easier to get on with your work if you know where everything is. Your Apps do not sort into any order and they are simply added to the next available slot. That can be on the first page of your apps or any other page. This can be confusing because it can become difficult locating certain apps. Below is my apps showing before I did a little tidy up, as you can see they are in no particular order and the three little circles on the right shows I’ve got two more pages of apps. You can imagine how frustrating it can be to find the App you want to work with. Similar to a mobile phone you can simply move the apps around by holding down your touchpad and then moving the app around the screen. This at least allows you to put your apps into some sort of order. However, it still does not fix the problem of information overload. If you’ve got pages of apps whether you have them in order or not, you still have to look through all of the Apps to get to the one you want. Luckily, you can group your Apps together and we’ll look at how to do this now. The first thing you need to do is to take a look at the Apps you’ve got on your Chromebook. It will take a little time to group your Apps together, but once you’ve done this you’ll feel much better. 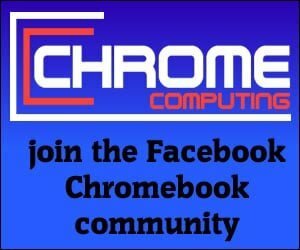 It will feel like you’ve given your Chromebook a spring clean. It’s easy to know what sort of Apps to group together and everyone will want to do it slightly differently. However, I’ll show you how I grouped my Apps together, so you can see what I mean. First of all, you should look for Apps that are relevant to each other. Some are easier to identify than others. I’ve got a few games from the Android App store, so they can easily be grouped together. Then I’ve decided to group together any streaming apps that I use. I’ve also grouped together a calendar and calculator App and put them under Accessories. This can be a little tricky at first, which I found out when I started to group my Apps together. It all depends on where the icon for the App you’re trying to group is located. If it’s located to the far left or right it can be difficult to add together. You’ll soon realise what I mean when you try it for yourself, but it’s easy to fix. If you do have problems, simply move the apps to the centre before you try to group them together. Let’s group together the Google Doc Apps, so this includes the word processor, spreadsheet and slides application. To do this you simply hold down your touchpad on one of the Apps. You then continue to hold down the touchpad and move the Icon for the App on top of another App you want to group. For example, if you’re holding down the word processor App, you want to drag this App on top of the spreadsheet App. Once you’ve done this just let go and the Apps will group together. You continue to do this by adding any further Apps to the group you’ve now created. When you group apps together they are put into a folder. 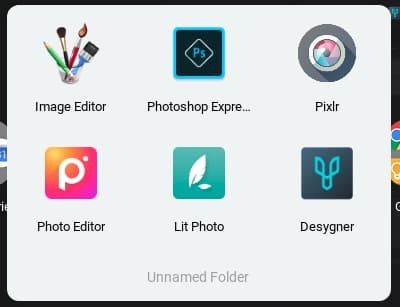 At first, the folder does not have a name, which can make it difficult for you to find the App you want at a later date. You can give each of your folders a name, so you can easily find the App you’re looking for. To do this click on the folder, so it displays the Apps within side the folder. You should then see something similar to the image below. You’ll notice the Apps are sitting in a folder named ‘Unnamed Folder’. To name the folder just click on this text and type the folder name that matches your Apps. You can then hit return or simply navigate away from the folder. You’ll now see the folder is named, which will make it easy to find later. 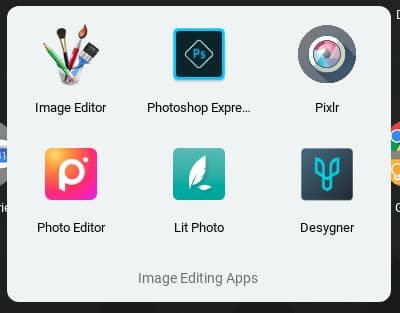 You can see below that I named this folder ‘Image Editing Apps’. You can continue to do this for all of your Apps. Some Apps you may decide not to put into a group, which is fine. However, you’ll find it much easier if you try to group as many Apps as possible. You can see above my Apps are now all grouped together in different folders. This makes it much easier to find Apps in the future and it looks a lot more organised.